Last month, it was announced that Futurama would be returning to television with all new episodes. The cast was supposedly already on-board for the revival but now the studio is trying to replace them. Futurama begins as a pizza delivery boy (Billy West) is accidentally frozen and then wakes up 1,000 years later in the far-flung future. He gets a job at Planet Express and meets a myriad of strange characters played by actors like Katey Sagal, John DiMaggio, Lauren Tom, Phil LaMarr, Maurice LaMarche, and Frank Welker. The animated series was cancelled after a troubled four season run on FOX and then found new popularity in reruns. The characters were revived in four made-for-DVD movies and the films were then reworked into another season of television shows. Those were popular enough to cause the show to be revived for 26 additional half-hour installments. When the new episodes were announced last month, stars like West, Sagal, and DiMaggio were said to have already been signed to return. That wasn’t quite true. The actors had all expressed interest in returning but the contracts hadn’t been signed. Now, because of salary disputes, it’s not happening at all. Will you watch if the actors are replaced? No way! Are you kidding? As part of the deal to produce the new episodes, the production budget had been severely cut. When the offers came in for the talent, they were significantly lower than what the actors had been expecting. It’s unknown what 20th Century Fox TV offered but Variety reports the actors receive about $75,000 per installment. Via Facebook, LaMarr says Variety is incorrect and that they’re asking for much less. The studio and performers weren’t able to come to an agreement so the executives have decided to put out casting calls to replace West, Sagal, DiMaggio, and LaMarche with cheaper, sound-alike actors. The reaction to this turn of events has been understandably negative from fans of the show. Other voiceover professionals, some of whom could conceivably land the jobs, are also standing by their fellow actors. 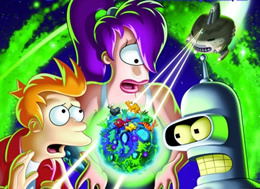 Of course, the studio may still be able to work something out with the Futurama cast. Fox tried a similar ploy they played hardball with the cast of The Simpsons several years ago. That became a public relations nightmare and a new deal was eventually hammered out. Insiders caution that this situation is a bit different since the reduced production budget is making it possible for the show to be made on a cable budget. However, as part of the deal, the show could still be sold for a broadcast network run. If that were to happen, the studio’s profits would increase significantly. What do you think? Do you care if the characters’ voices are different? Or, are you just interested in the quality of the stories? Are the voice actors as replaceable as Fox would have us believe? Oops I meant in the name of saving a buck! I find it totally offensive to replace talented voice actors who brought life to lovables characters in the same of saving a buck. I’m not a voice actress but I respect them and I’m sick of our country downplaying the value of voice acting talent. You can’t just replace voice actors at the drop of a dime. The voice actors and actresses play a role in breathing life into the characters and choosing the wrong voice actor ruins an otherwise lovable character. If I was a voice actress and I happened to be really good heck yeah I’d want a salary increase. futurama is one of the greatest shows ever made, it trumphs simpsons, family guy and southpark, im really wishing fox would get their heads out of their asses and just fork over the cash, futurama outsells most other tv shows for dvd sales, your money will be made back..
Lauren and the other great voices werent there, I would loose all respect and all interest in the show. This show has been a family favourite since the first show and I dont want to watch a show this clever because the voices are what makes the show. Good Luck actors we hope your voices stay!!!! They changed the latinamerican voices for the movies and it was COMPLETELY AWFUL. I didn’t not watch more than half of one and I did not buy the dvds, they were HORRIBLE. So I got used to the english voices… but if they do this, the show is dead for me. Won’t watch without original actors! Well, according to the current status of the “Would you watch it?” poll, only 9% of the people who voted would watch new episodes if the actors are replaced. Seems like incontrovertible proof that they should not be replaced. II. Replace the actors with sound-alikes (not perform-alikes), “save” a couple bucks, lose 90% of their fanbase and have a phenomenal failure on their hands. You would have to be mentally retarded to think that Katie Segal, Billy West, John Dimaggio, and Phil LaMarr are replacable. Futurama was character driven comedy. If you fired Gracie Allen and gave George Burns a new wife, would that still have been the same show? If you got rid of Aunt Viv on Fresh Prince of Bel Air, would that…oh wait…nevermind. Point is, you can’t get rid of the actors in a character comedy. The show won’t work.